Would you like to deepen your knowledge in AntiGravity® and coach your participants to connect body, mind and spirit? During the 2-day teacher training in AntiGravity® Restorative Yoga you will be given all the tools you need to teach AntiGravity® Restorative Yoga in a safe and nurturing way. Be able to teach 3 new class designs with extensive material. AntiGravity® Restorative Yoga is all about healing as you float through gentle gyro-kinetic motions, deeply opening the entire spine, hips and connective tissue. 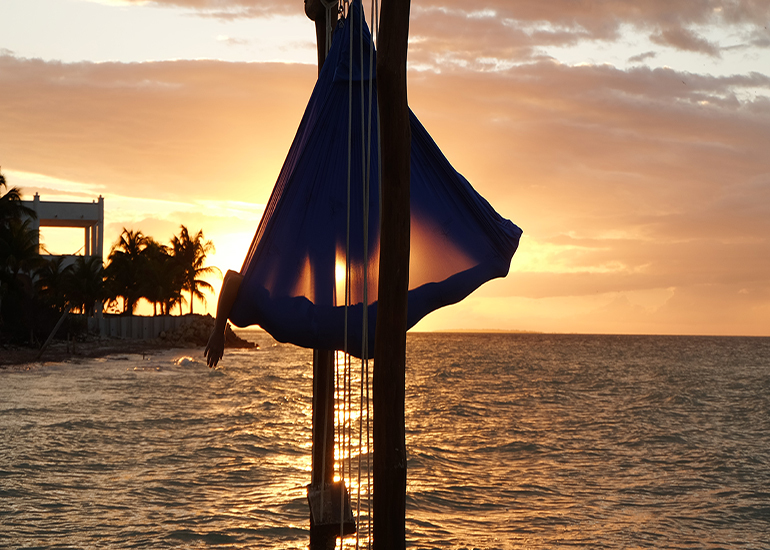 You will connect body, mind & spirit through levitated meditations and floating shavasana in your AntiGravity® Hammock. Requirements: You will need to be a certified AntiGravity® instructor (AntiGravity® Fundamentals 1&2) to take this course. You do not need any prior yoga training or likewise. However it’s important that you are comfortable to lead students and have a desire to help them develop through your coaching. Other important qualities are a desire to happily share your passion for AntiGravity®, that you are clear, happy and see all students equally.